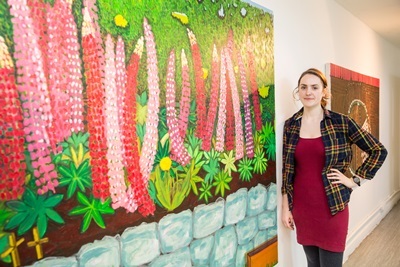 A Ballymena art student has used her childhood memories of growing up in the middle of a divided country to create a series of bold paintings that will go on display this month. Emily Hill (23), who is in her final year at Gray’s School of Art, will unveil her work as part of the art school’s annual degree show and has spoken about the inspiration behind the pieces she has produced. The former Cambridge House Grammar School pupil, who has won a number of prizes for her paintings, said: “My inspiration for this work has developed from my personal memories of my up-bringing back home in Northern Ireland. “Growing up I have strong memories of happy moments on the run up to and during the summer holidays as a child. At my granny’s house, this is where family and cousins would come to meet up and as children on a farm there is plenty to explore and discover. “Around the summer holidays, this is when the ‘marching season’ would begin in July with the Orange Order parades – and with this an increase of signs and symbols would be more evident, various flags, colours and motifs from both cultures would start to show, imposing this feeling of ownership on an area. Emily uses oil paints in her work, employing layering marks and bold colours to resemble the forms she is painting. “Colour is used to exaggerate the heightened view a child may have on their surroundings, what a child’s innocent eye may notice first before the reality that surrounds them,” she said. Emily is pleased with the way that her final show at Gray’s has come together and has fond memories of her time at art school in Aberdeen. “I have found my time at Gray’s a very challenging and exciting four years,” she said. “I have learnt a lot from my peers and my tutors which I know will hold me in good stead when leaving Gray’s. If I could do it all again, I would. Emily’s work will be on display as part of the Gray’s School of Art Degree Show, sponsored by BP for the twelfth year, which runs from June 20 to 27.